Compare it with a soap or detergent cleanser. Those break down the oils, too, but they strip your skin, fooling your oil production center into thinking, "Oh, noes! There's no oil left! Ramp up production, pronto!" And so it's an endless, tedious cycle: Over-oily skin, strip to squeaky dryness, skin becomes even oilier, repeat. What oils work best on acne-prone skin? Castor oil is great for really deep cleansing those pores, particularly if you're prone to blackheads or other blockages. However, it can be drying if your skin's sensitive, so I mix with jojoba as a carrier oil to cut the intensity. Jojoba oil is an almost exact match for your skin's natural sebum, so it's very gentle on skin and won't clog pores. You can also use jojoba oil for hair conditioning, body moisturizing, lip balm, makeup removal, shaving prep and aftercare, and massage oil, so having a bottle will come in handy. A good ratio to begin with is 25% castor oil with 75% jojoba oil. You can gradually increase the castor oil up to 75% if your skin doesn't react negatively along the way. Other oils you can investigate include avocado, olive, argan, apricot, grapeseed, sunflower seed, and almond. I've heard enough horror stories of coconut oil and acne to steer clear of putting it on my face — for every one person who swears by it, there are five who say coconut oil (in all its various forms) made them break out a zillion times worse. If you experiment with any of these other oils, including coconut, let me know how they work for you! 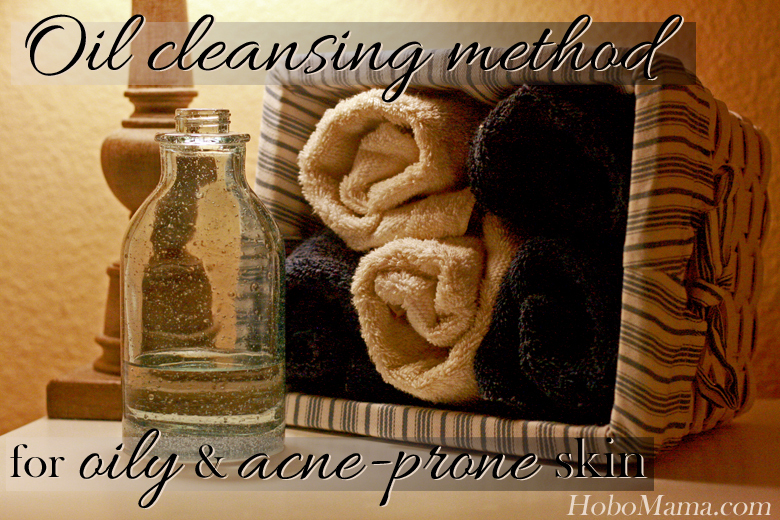 How do you perform the oil cleansing method? I do my oil cleansing in the shower, where the steam helps open the pores and makes the oil cleanse more effective. You can also do it at the sink. Pour the preferred amounts of each oil into the palm of your hand. I use just enough to fit easily in my palm and then cover my face. (Oil spreads easily, so I'm not sure of an exact amount.) I keep my two bottles of oil in the shower caddy so they're always at hand. There are some warnings to store oils in a cool, dry place so they don't mold, so it might be better to pre-mix a smaller amount in a separate bottle, then refill as needed. I haven't had a problem with storing them in the shower so far myself. Smooth the oil over your face. I avoid the eye area in case of sensitivity. You can also wash your neck and chest with the oil if you'd like. Grab a clean washcloth, get it wet with warm water, and squeeze it out until it's warm and damp. Drape it over your face. Leave it there for several moments, until it feels like it's cooling. Continue your shower or other ablutions. I like to let the oil sit on my face as long as possible, so I don't rinse till the end, giving it plenty of time to penetrate and dissolve whatever's in my pores. Before rinsing, re-wet and squeeze out the washcloth, and drape it over your face again. Again, let it sit for several moments as it steams your pores close-up. Now rinse with warm water. I like to use the washcloth to gently rub down my face, pulling off the excess oil. Don't scrub harshly — just gently swipe. It's all right if a fine layer of clean oil remains behind; it will keep you helpfully moisturized. 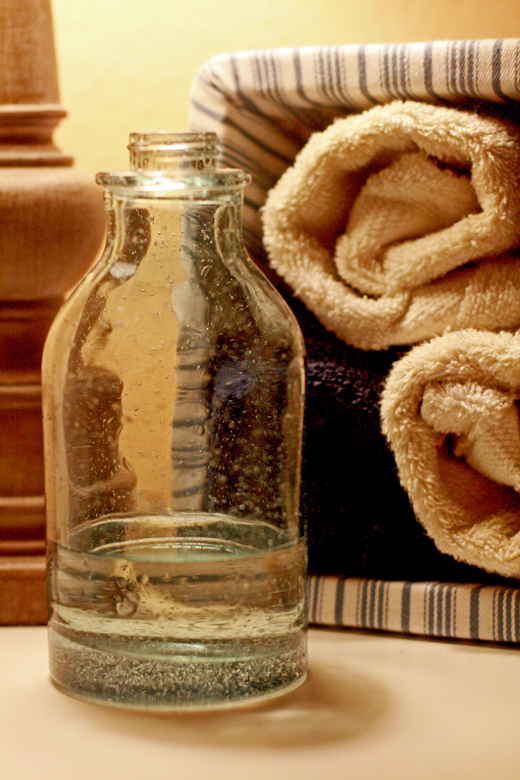 This is the easiest, least time-consuming way I've found to oil cleanse. Yes, you do have to stand and breathe with a warm washcloth over your face for a little bit, but we can all use a washcloth-over-the-face break now and then, right? It doesn't take much more time than a conventional cleansing, and it feels so spa-like. How often do you need an oil cleanse? I use the oil cleansing method every time I shower, which is to say about twice a week. When I was first experimenting with the OCM, I tried it out twice a day, morning and night, the same way I used to wash my face with conventional cleanser. However, I find that washing my face with water only, or not washing it at all on the off days, works just as well as my previous methods of twice-daily cleansing! So I don't wash my face at all except in my showers, when I oil cleanse. Your mileage may vary, but you'd be surprised how little actual cleansing can be necessary to stay clean and keep your skin happy! Note that there might be a transition period where your skin is oilier as your skin adapts from being daily stripped of oils to keeping the natural sebum intact. Give it at least a couple weeks for the oil production to regulate. Will oil cleansing cure my acne? It didn't for mine, but you can give it a try! I found my acne no worse with oil cleansing, so I'm happy enough with that. I'd been hoping it was a magic cure, but my acne's more powerful than that. If you have mild acne, or acne that's been specifically brought on by over-washing and using irritating chemicals, certainly using a gentler cleaning method like oil cleansing might help. Personally, as I continue to refine my diet and keep my skincare as natural as possible, I still find I need some form of twice-daily acne treatment: either 2.5% benzoyl peroxide (see my post about this easy and inexpensive regimen) or a high-quality 5% salicylic acid (no relation to this company — I just like this product a lot). That said, I'm very satisfied with oil cleansing and love the smooth, clean feel of my skin after each cleanse! Do you oil cleanse? What oils and methods do you prefer? 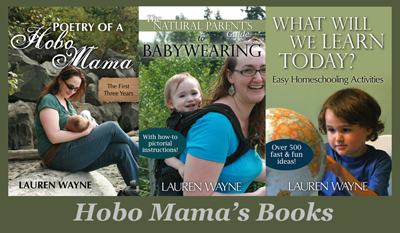 Hobo Mama, despite the professional-sounding name, is not a doctor of any kind. If you have concerns or questions about your skin health, please consult a medical professional of the non-hobo variety. If you want to double check with a dermatologist about anything in this article, please do! Best cleansing method I've found :-) In dry or winter areas I pair heavier oils like avocado or coconut with the castor. In tropical areas I use grapeseed or hazelnut. Jojoba works with any climate for me. I did some research back when my skin wasn't balanced and learned a lot from the folks at the Garden of Wisdom, plus their products are high quality. I used olive oil and castor oil for a couple months and broke out with painful acne. Found this blog post and will try tonight with 75% jojoba and 25% castor. Can't wait to try it- thanks for posting!